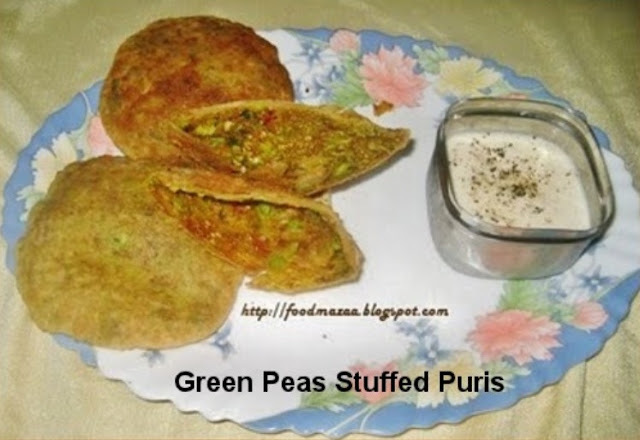 Try out these delicious puris stuffed with green peas masala. Gram flour / besan ... 1 tbsp. Coriander seeds .......... 1 tbsp. Cumin seeds ............... 1 tsp. Amchoor powder ........ 1 tsp. Coriander leaves ......... chopped finely. 1. Boil green peas. Drain the water and set aside. 2.Dry roast coriander seeds, cumin seeds, aniseeds and dry red chillies. 3.Heat a tsp. of oil and fry the besan. 4.Crush the green peas with fingers and mix the ground masala, besan, salt, amchoor powder, a pinch of turmeric powder, coriander leaves and mix well. 5. Knead a soft dough adding salt and a tsp. of oil. If the dough is hard the filling comes out while rolling. 6.Roll out a small amount of dough, stuff the filling, seal it and roll into puris. 7. Deep fry the puris and serve with curd or pickle. Thats a very interesting puris..tempting.. True and quite filling too. Thanks for stopping by my blog. This looks good and sounds great! 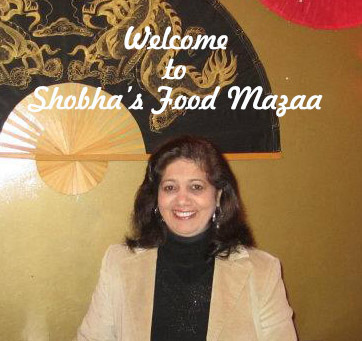 Shobhaji, my mouth is watering here. Thanks for sending over those delectable puris.